Summer vacation has taken its toll. We bought a new car at the end of April, and it already has 6,000 miles on it. I’ve driven from Charlotte to Hilton Head to Asheville and back again. And then made a quick side trip down to South Florida. Needless to say I’m tired of driving. And I’m even more tired of eating on the road. So, now that I’m finally back home and have picked up my first box (really, boxes) of beautiful produce from the Farmer’s Fresh Market, you can imagine my excitement at being able to finally start cooking again. Only, it turns out my husband wants hamburgers for dinner. What’s a girl to do? My poor dear husband has actually been worse off than I have been in the food department: He’s had to cook for himself. So hamburgers it is… but it’s hamburgers MY way! Soak onions in water/vinegar/sugar for 2-4 hours in the refrigerator. Drain well for 45 minutes in a colander. Pat dry. Mix onions with mayonnaise and celery salt. As I shoveled this dip into my mouth (using any available vessel… club crackers, cucumbers, a spoon) I marveled at how such simple ingredients could yield something so marvelously delicious. I figured this could elevate anything you put it on (or in)! I enjoyed this dip so much, I took a copy of the recipe and a bag of Vidalia onions with me to the mountains for my annual girls weekend trip. On that long drive from Hilton Head to Asheville I was listening to the Martha Stewart Radio show “Everyday Food”. Would you believe the episode I was listening to was about CONDIMENTS! The host asked for people to call in to share their favorite condiment. And that’s exactly what I did. Julie from Charlotte was live on Martha Stewart radio sharing the recipe for Vidalia Onion Relish! Now, back to our regularly scheduled programming… My favorite girls were a little doubtful that onions and mayonnaise would be something worth eating… but the indulged me yet again! And all weekend long, every time I turned around I saw someone shoveling onion dip into their mouth!! On hamburger night, we brought out what was left of the relish and put it on top of our burgers. Now THAT was delicious! Fast forward to last night. I had half a bag of Vidalia onions left over from that trip, so I make the Vidalia onion relish. I knew it was good ON a hamburger, so if figured it would also be good IN the hamburger. I took my ground beef (grass fed, locally raised) and mixed in about a tablespoon of Dijon mustard, a tablespoon of Worcestershire sauce, about 1/2 cup of the onion relish and some salt and pepper. 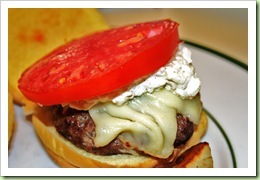 I added some cheese, another dollop of the relish and a slice of the juiciest tomato around! The Hamburger was humble no more.